The front basket is a great for keeping small items in reach while youre driving your scooter.Your wallet, purse, keys, jacket, or other items are conveniently stored in this tiller mounted basket. Will work with any Golden Tech scooter, simply select your scooter type from the list. 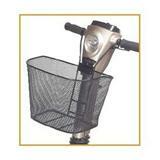 You will sent the appropriate basket an all necessary mounting hardware .